I didn’t really ever enjoy sweet potatoes until my adult life. Dipped sweet potato fries in some honey mustard sauce and never looked back. I’m a fan of potatoes in general, especially at breakfast, but I’ve tried to eat less and less to help my stomach from getting bigger and bigger! 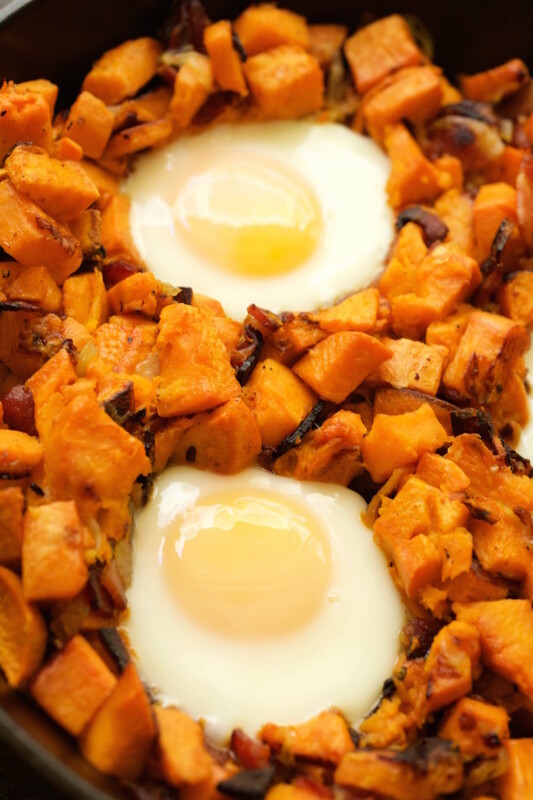 When I found this recipe for a sweet potato hash, I figured I could make an exception because maybe it was a little bit healthier than using regular potatoes;-). Then I added one of my favorites….bacon…. and this combination of ingredients became something I’d like to treat myself with more often, but will save for special occasions. Preheat the oven to 400 degrees and cook bacon slices for 15-20 min or until crispy. While bacon is cooking, peel onion and cut into slices. Cut those slices into half-moons and half-moons into halves. Melt the butter into a pan over medium-high heat and add in the pieces of onion. Sprinkle lightly with salt. Cover pan with a lid. Lower the heat of the onions, stir occasionally, and cook until dark brown and caramelized. While the onion is cooking, peel the sweet potatoes and cut into cubes about ½-inch to a side. Place in a bowl. Finely mince the garlic and add in with the sweet potato as well as the Nature’s Seasoning (at least a teaspoon), the salt, pepper to taste, and the olive oil. 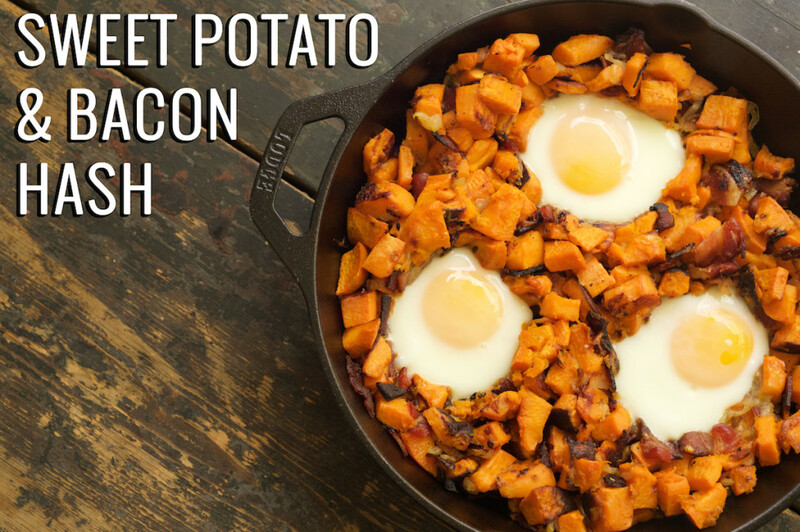 Chop up the bacon into smaller pieces and mix in with the cooked onions, then add into the sweet potato mixture. Line a large baking sheet with foil and grease lightly. Spread the sweet potato mixture onto the baking sheet evenly and roast for 20-30 min or until the sweet potatoes are soft and browned. Lower heat of oven to 425 degrees. Spread the hash into the bottom of a well-greased skillet. 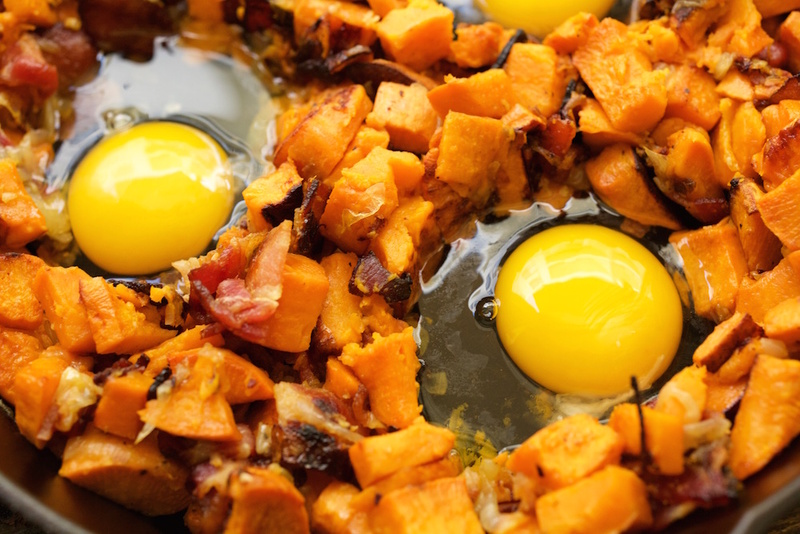 Make three small wells in the sweet potatoes and crack an egg into each. Place skillet into oven for 10 min or until the eggs are baked.